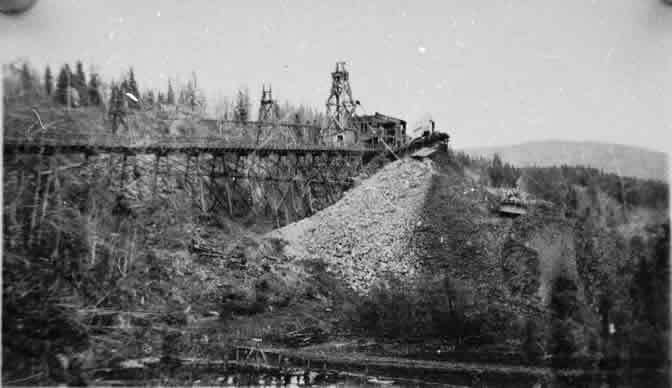 Slate creek produced much gold from the earliest years and although it was considered part of Manson Creek community, had a number of resident miners. The tertiary Germansen-Manson channels cross Slate Creek at Slate lake. The channels then continue on to cross Manson Creek at Discovery Bar then continues to cross Lost Creek. Wherever this channel crossed the present day creeks they were very rich with fairly shallow overburden. 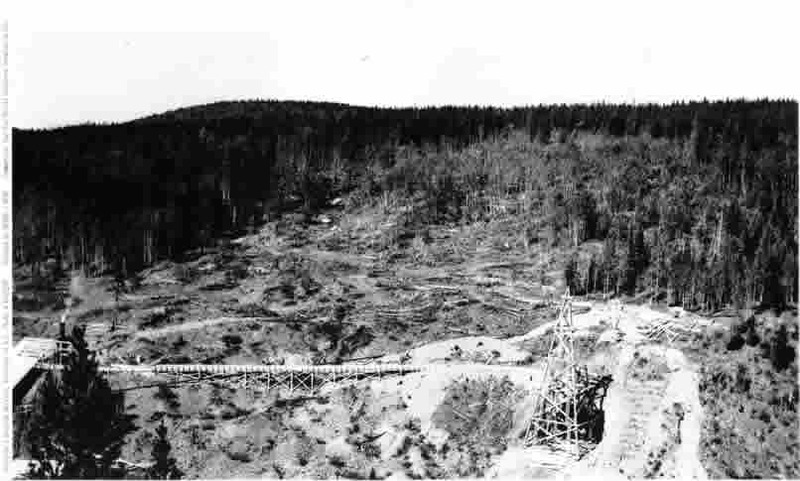 The 43rd company was one of the first to mine Slate Creek in a large scale fashion. They used the hydraulic lift method. The force of water would lift the pay gravel up to and into the sluice box. The upper left photo is the 43rd bunk house and the right is the hydraulic lift and sluice. 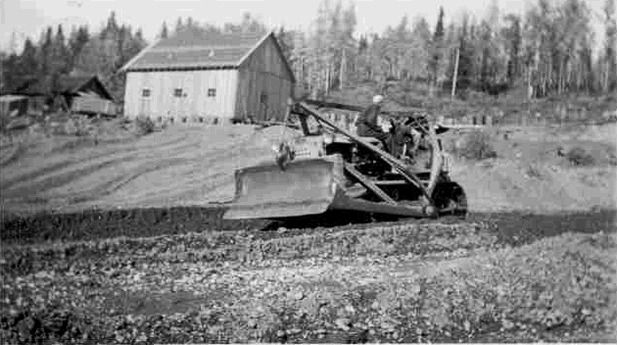 Later in the 1920s & 30s another larger company took over the Slate Creek claims. 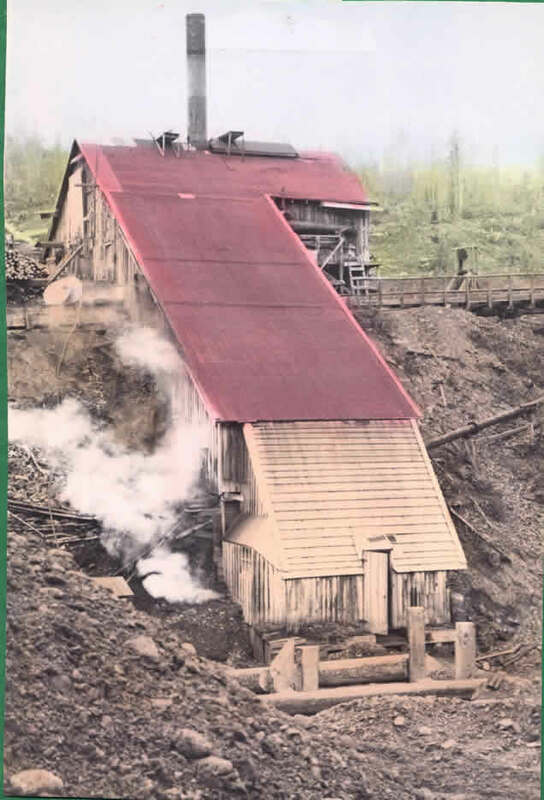 This was the Consolidated Mining and Smelting Company or C.M.&S. This company later became known as Cominco. 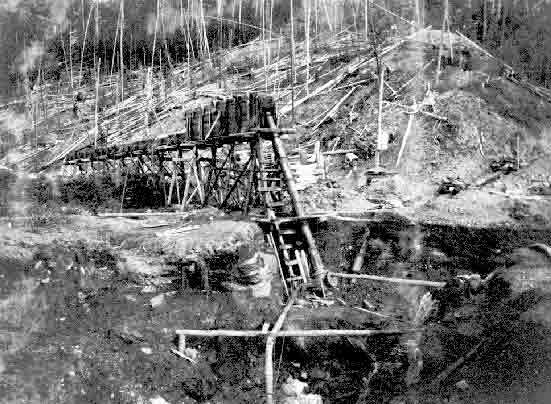 They also used the hydraulic lift method of mining which did not work that well and left much of the bedrock unmined. The photo on the upper left shows some of the Slate Creek settlement and the new operation with its steam donkey just beginning operation. The photo on the right again shows operation just beginning. 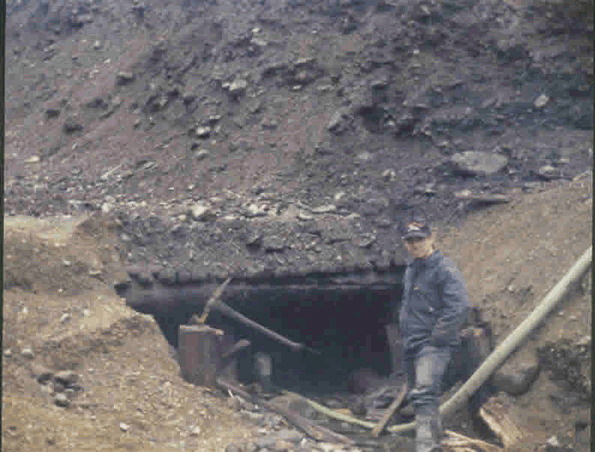 The tailings of this operation were used to dam Slate Creek creating a lake which is now Slate Lake. 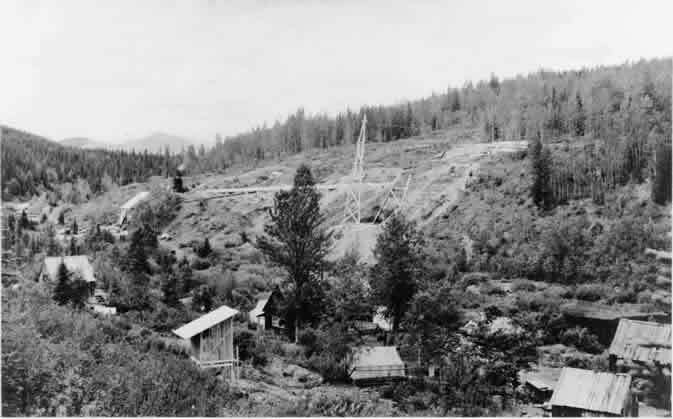 Upper left is an aerial view of the flume and processing building just being build. Right is a finished view of building. 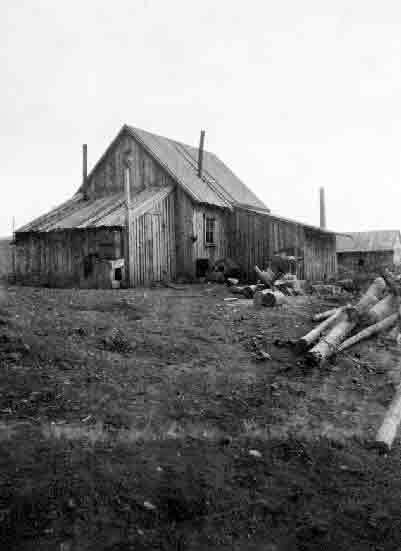 Billy Steele shown in front of his Slate Creek cabin. He lived here many years much to the chagrin of the C.M &S manager. Upper right is a cat operating at C.M.&S. Upper left is the discovery of old drifts and artifacts at Slate Creek in the 1990s. 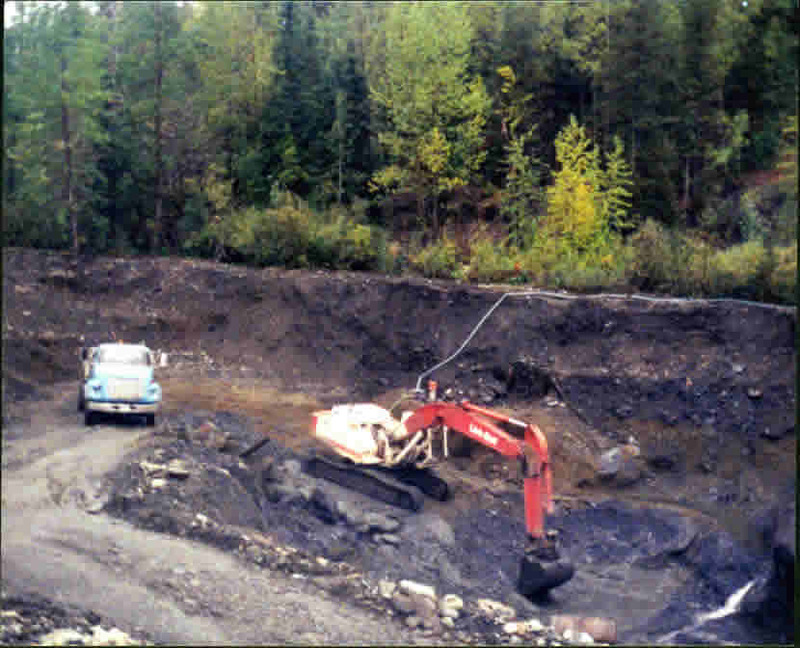 On the right is cleaning bedrock on Slate Creek in the 1990s. Slate has been a good producer for over a hundred years and still continues today.